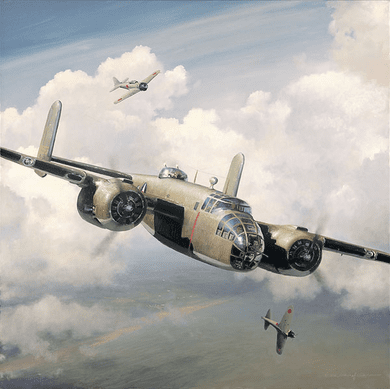 William Phillips Limited Edition Giclee Countersigned by Surviving Doolittle Members:"Engaging the Enemy"
Size: Paper: (As Shown) 23" x 23" - 26 1/2"w x 31 1/2"h. trim / Canvas 24" w x 24" h.
Edition: Artist Signed and Numbered, Limited to 250 with 50 Canvas Editions COA included. Engaging the Enemy was painted specifically for the 69th Omaha reunion, home to pilot Richard O. Joyce. The fine art canvas is an exact replica of William S. Philllips' original 24" x 24" painting. Only by spending tens of thousands dollars for the original could you possess something better. The edition is limited to just 50 copies, so only a few will have the chance to own one. The fine art print is three pieces of art in one. Two printed remarques, original Phillips pencil renderings of a Mitsubishi Zero and Crew 10's Mitchell B-25 Bomber, enhance the entire presentation and frame the Raider's signing area. The reproduction quality of this Giclée paper is second to none. Doolittle Raiders committed to sign: Col. Richard E. Cole, Col. Robert Hite, Lt. Col. Edward Saylor, Maj. Thomas Griffin and S/Sgt. David J. Thatcher.